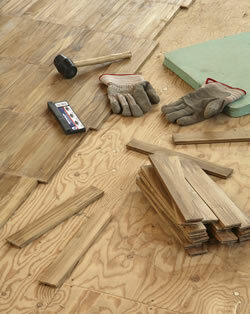 Your subfloor is the most important part of your hardwood or new flooring installation. A subfloor in poor condition will be reflected in the final quality of the finished floor. 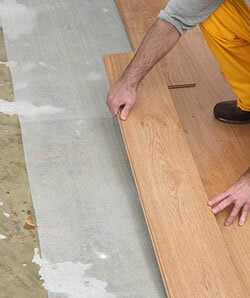 Subfloor preparation is probably the most important aspect of any flooring project. Your subfloor, usually concrete or plywood is the layer of building material directly below your flooring and it’s condition will ultimately decide how the finished floor will look, how it’s going to feel under your feet when you walk across it, and how long the floor will last you. Many common flooring problems like clicking when you walk across it, high spots, low spots, soft spots and tightness all point to issues with the subfloor that could have easily been avoided with a more detailed installation. This is a major issue in the building industry because most builders don’t want to spend the extra time required in preparing the subfloor, thus they pass the responsibility to the flooring contractor who usually doesn’t allow for very much subfloor preparation in their bid, if any at all. If you’re looking for the highest quality flooring job there is no question you’re going to need subfloor preparation. J & J Wood Floors are specialist flooring contractors. 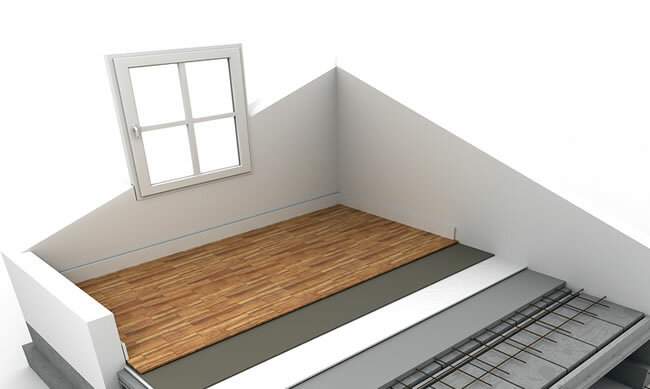 We understand what a subfloor is, and we understand how crucial the subfloor is to the final finished floor that we present to you. Over the years we’ve delivered problem solving solutions and expertise to our customers for their most challenging subfloor issues. Our experienced crews can implement solutions to repair or rebuild your subfloor and bring it up to manufacturers standards so that your finished floor looks as elegant and flat as you’d envisioned it to be. J & J Wood Floors is the flooring company that’s prepared to go the extra mile to make sure the job is done right. We specialize in flooring projects that have complicated subfloors or that other flooring contractors couldn’t complete properly. Prior to any work being completed the subfloor must first be entirely cleaned of all building materials, this includes left over drywall spatter and paint. Then with the proper tools and measuring instruments we can check the flatness of your floor to determine what exactly we’ll have to do to fix it. Most concrete subfloors should not exceed 3/16″ of inch height difference over a 10 foot span to stay within most flooring manufacturers installation guidelines. We can usually prepare a concrete subfloor by sanding down the highspots (we use a dustless system) and using a concrete filler or self leveling compound for the low spots. In some extremely rare cases, we’ve even had to redo entire concrete slabs. We can solve your concrete subfloor issues. Wood subfloors offer a different set of problems than a concrete subfloor. Wood can be highly affected by it’s environment, namely excessive heat or moisture which will warp the wood. This causes the creaking and cracking commonly heard as you walk across a floor laid on a wood subfloor. Sometimes repairing a wood subfloor could be as simple as replacing a few sheets of plywood and doing a general cleanup, all the way up to replacing problem Floor joists made with poor quality or warped lumber. Because there are so many issues associated with a poorly done wood subfloor it’s best to have the pros like J & J Wood Floors come out and take a look at your project. If you are having subfloor problems or just want to make sure you’re going to have the best hardwood flooring installation around then you need to give J & J Wood Floors a call or send us an email today.